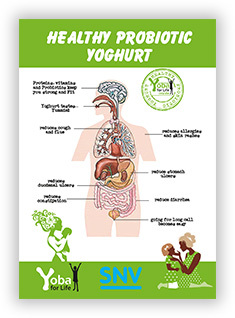 The Yoba for Life Foundation partners with SNV (The Dutch Development Organization) on the implementation of the ‘pre-primary probiotic program’. This program is part of the larger The Inclusive Dairy Enterprise project (TIDE project), which is rolled out in 7 districts in South-West Uganda. 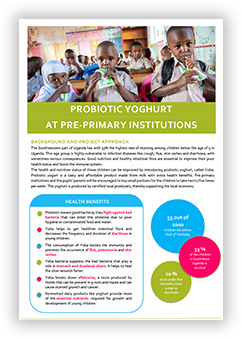 The aim of the program is for children in pre-primary institutions to consume probiotic yoghurt through a commercial sustainable model whereby either their parents bear the cost of increased fees towards the purchase of probiotic yoghurt, or the institution fits the costs in its current budget. The program helps to improving health of young children (<6 years) who commonly suffer from incidences of diarrhea, Respiratory Tract Infections, skin rashes, and retarded growth. Six Yoba field officers move every day to the schools to convince the school management and subsequently the parents to take up this program for good health of their children. Since its inception in February 2018, 15,000 parents have enrolled their children in the program, and the children enjoy the health benefits of regular consumption of probiotic yoghurt. 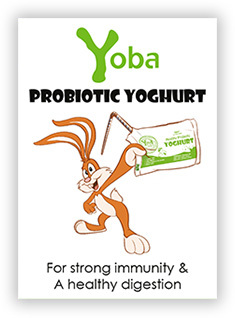 Apart from the health benefits, the program increases market for small scale producers of probiotic Yoba yoghurt, hence increasing employment opportunities and household income.